Actually the Shmoos were creared by Al Capp ib Lil Abner, I believe! Given the shape of the Schmoo characters in Al Capp's Li'l Abner comic, I can certainly imagine that there'd be a punching toy based on them. See the "Shmoo" entry in the Comics gallery, and at Wikipedia. Don't recall the Shmo but there was something called the Shmoo. A punching toy, wasn't it? I agree with BET.....never heard of it either. I feel like more of a schmuck than a shmo. I NEVER HEARD OF SHMO BEFORE. THIS IS A NEW ONE FOR ME. This was my favorite game growing up!!! It was a board game, the "board" was the size of the Twister mat, it had dice in what looked like a giant egg timer, game "men", and Shmo cards. When you got on to one of the spaces that you needed to take a card you had to do what it said on the card (ie: Waddle like a duck saying "I'm a shmo!"). 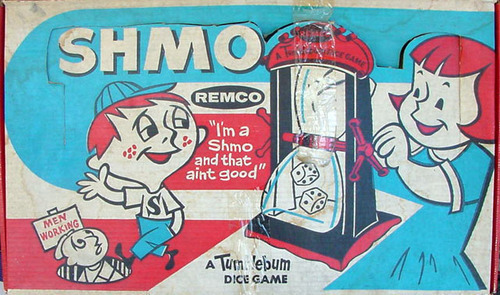 Let's face it you made a complete idiot of yourself playing this game and the person who "won" was the real Shmo!! !